When it comes to staying warm and protected in the water, wetsuit thickness matters which is why we’ve created this helpful, easy-to-understand wetsuit thickness guide. This wetsuit thickness guide makes it easier for you to choose the right wetsuit for your unique watersport needs. We’ve broken this wetsuit thickness guide into four major watersports and common wetsuit temperatures. 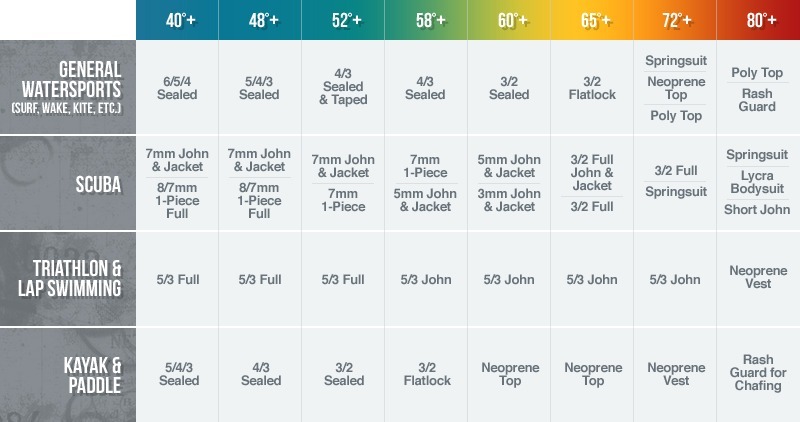 If you’re planning on diving in 52°F & up water temps and aren’t sure what wetsuit you’ll need, simply use the guide to find the colored top column that says ‘52°+’ and find the side column labeled ‘SCUBA’ and you’ll see that we recommend wearing a 7mm John/Jane and 7mm Jacket OR a 7mm 1-Piece Fullsuit depending on whether or not you want to wear layers. Follow the same directions to find the perfect wetsuit regardless of whether you need a wetsuit for a triathlon or for lap swimming. Are you going to be in 72°F+ water temps? Based on the wetsuit thickness guide, we recommend going with a 5/3mm John or Jane. Easy enough, right? If you need additional help on figuring out what to wear for your next watersport adventure, feel free to contact our customer service either via email (service@wetsuitwearhouse.com), live chat, or call us at 866-906-7848. With our large selection of wetsuits and accessories, Wetsuit Wearhouse has everything you need to enjoy your time in the water!